Much has been written about the digital oilfield, just Google it and you’ll get pages of results. The term has been around for nearly 20 years, and we thought it would be fun to provide a high-level overview of what it means and assess where we are in terms of progress. There is a list of several resources at the end of the post if you’re interested in reading more. Or just Google it! Ok, let’s start with defining “digital oilfield.” Essentially it is a concept within the oil and gas industry that intersects technology, data, automation, and people. In its simplest form, the digital oilfield allows companies to do more with less. It integrates technology, data, and processes to help companies leverage existing resources (people) more effectively, make better-informed decisions, increase operational efficiency, maximize recovery, and decrease HSE risk. The goal is straightforward – companies can visualize reserves more clearly; optimize drilling, completions and production plans; and manage operations more efficiently – but the reality and implementation are not. If you go back to the early 2000s, the oil and gas industry was beginning to see the potential value that could be gained from digital technology. According to several sources, one of the main catalysts was the need for high-performance computing power for seismic processing and imaging, and reservoir characterization and simulation. Believe it or not, seismic processing providers were among the first users in terms of “Big Data” as their requirements for ever-increasing capacity and speed were needed to support advanced modeling and visualization. 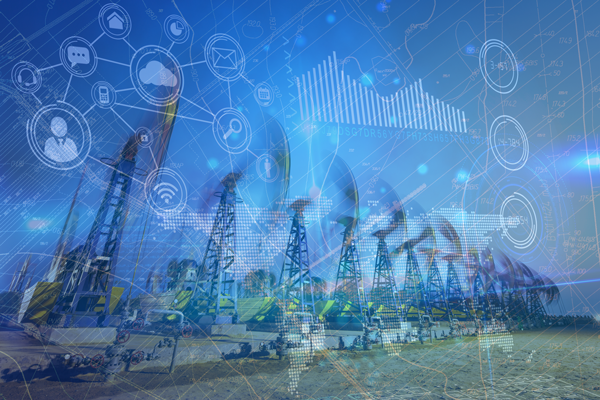 The next wave of the digital oilfield occurred somewhere around 2006 as more sophisticated technologies, sensors, and real-time systems became prevalent across the oil and gas value chain. Data from techniques such as measurement while drilling (MWD) and logging while drilling (LWD), began to flow back from the drill bit. These technologies captured data with higher frequency in real-time or near-real-time and provided more in-depth insights into drilling and completions operations. The magnitude and variety of data also sparked the need for closer collaboration between geoscientists and reservoir engineers, and for solutions that aided integration and provided a more holistic view of the reservoir. This is also around the time that new production facilities were being designed with a forward-looking view of the future and included more sensors and automation. However, most of the data being generated wasn’t actually being used. Fast-forward to 2014, the industry experiences one of its biggest downturns, if not the biggest, in a generation. To survive, companies were implementing strategies to run lean through a combination of downsizing and/or abandoning projects. While this may have slowed some of the progress of the digital oilfield, companies also adapted by learning to do more with fewer resources. Operators turned their focus from exploration to production and looked for ways to improve operational efficiency and extract maximum value from reserves without sacrificing impact on the environment and to workers’ health and safety. “Big Data”, “Machine Learning”, “Artificial Intelligence” (AI), “Internet of Things” (IoT) – these are just some of the latest buzzwords that are making their way into our every day vernacular. Each holds fantastic opportunities for the industry and companies embracing these Industry 4.0 technologies. In the area of directional drilling, as just one example, the use of smart bit technology with machine learning and AI is providing engineers with more data about subsurface conditions so they can make informed decisions in real-time to guide the drilling process and improve drilling efficiencies and economics. Couple the use of Industry 4.0 technology with the Great Crew Change happening in the industry and you have the makings for significant change. The new generation of workers, or Digital Natives, entering the industry is very comfortable using technology in their personal lives and expect to use it in their professional lives, too. The other side of the crew change is the fact that a significant amount of knowledge and experience has left the Industry. What remains is a gap in knowledge and limited opportunities to transfer that knowledge. Those that remain are required to learn faster while also being more efficient. Stay tuned! In a future post, we’ll contemplate the culture change and business processes necessary for the Digital Oilfield to overcome challenges and create sustainable returns.